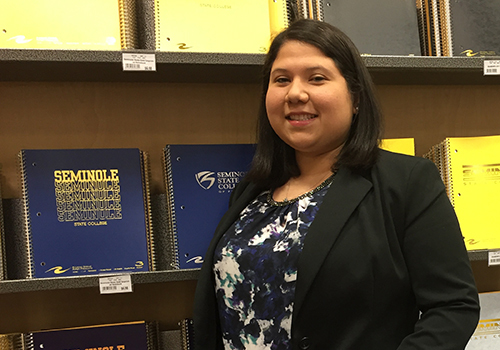 We take our ‘Five Minutes With…..’ feature to Florida and visit with Seminole State College of Florida Bookstore General Manager, Stephanie Birnbaum, who spoke to us from her new store about being a hub for her campus, preparing for spring rush and being where her customers are. My first job was as a receptionist at a retirement community while I was in high school, but as a freshman in college, I loved the UCF Bookstore and ended up getting a student position there. That was over 11 years ago! I tell people that I manage The Hub on campus: So many look to the bookstore as the first place they stop when they visit the campus, and on any given day you’ll get questions about financial aid, textbooks and the social scene on campus. I love that the bookstore is such an identifiable place on campus where so many people visit — and where we get to help everyone. Wrapping the spring rush — it’s the culmination of all the prep work of the last several months, and I love that first day when we have that big rush of students and get to see the fruition of all of the work we’ve put into this big event. How do you think Barnes & Noble College has changed since you first joined the company? The biggest change has been in our technology, and student expectations of technology and how they’re using it. Through our web sites, app and online tools, we’ve adapted to the way students want to learn, shop and interact with us. What do you think is the most distinct service that your bookstore offers to the campus? The fact that we’re growing along with the college we serve. I’m now General Manager of three stores here, and two of them are expanding into larger stores. It’s an especially exciting time to be part of the Seminole Family — to see how quickly it’s expanding — and to be part of that growth. 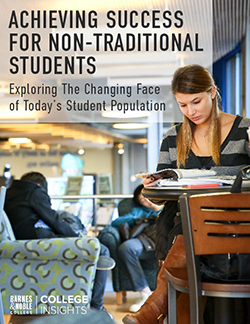 What do you think is the biggest challenge facing higher education today? 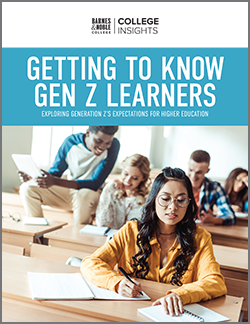 The biggest challenge for schools is being able to adapt to new learning styles and tailoring their curriculum to cater to this new generation of student preferences for learning. Why, in your view, is Barnes & Noble College such a great campus partner? We have a great sense of community with our students and faculty. Relationship building is really at the heart of everything we do, and as store managers, we have the ability to develop those relationships through VIP Nights, De-Stress Fests and author events — to create a stronger and more personal role for the bookstore on campus. I think I’d be a graphic designer. I really enjoy print and digital media. Can you think of two or three words that might best describe your Seminole students? They’re caring. Our biggest programs are public service degrees such as nursing, EMT and law enforcement, and you have to have heart for those kinds of professions. They’re also inventive, which you might also expect for a school with such a strong engineering program. Favorite part of the bookstore? You’ll find me wherever the people are! I love interacting with our customers. I’ll always like to own a physical hardcover book, but if it’s something I truly love I’ll buy the digital version and pull it up on my phone or iPad whenever I have a moment. Teamwork. There’s just a great sense of community and caring within our company. I’ve had so many! One of my earliest memories was as a textbook manager at UCF. We were overwhelmed with 20 pallets of books arriving on the same day, and our Territory Vice President, Brian Stark, tasked us with getting it all unpacked. The next day, we had it all shelved — and he bought us all lunch. I think you know you’re working with exceptional people when everyone comes together like that.